Find center of two 3' lengths of rope by folding in half and stitch together in a cross formation with a couple quick stitches. Begin knot at cross by taking rope #1 around thumb and over rope #2. Take rope #2 over rope #1 and over rope #3. Take rope #3 over rope #2 and over rope #4. Take rope #4 over rope #3 and threw loop on rope #1. Tighten all ropes to create knot. Repeat to create two sections of knot. Create mouse ears by looping any two consecutive rope tails on finished two section knot. Stitch in place with needle and floss. Add remaining 2' section of rope to existing knot by placing center of rope accross center of knot, making 6 rope tails. Continue to make Knot just like before only using 6 strands instead of 4. Begin at cross by taking rope #1 around thumb and over rope #2. Take rope #4 over rope #3 and over rope #5. Take rope #5 over rope #4 and over rope #6. Take rope #6 over rope #5 and threw loop on rope #1. Repeat to create four or five sections of knot. Create tail for mouse and remove one rope by cutting back shortest rope and tucking it inside center of finished knot. 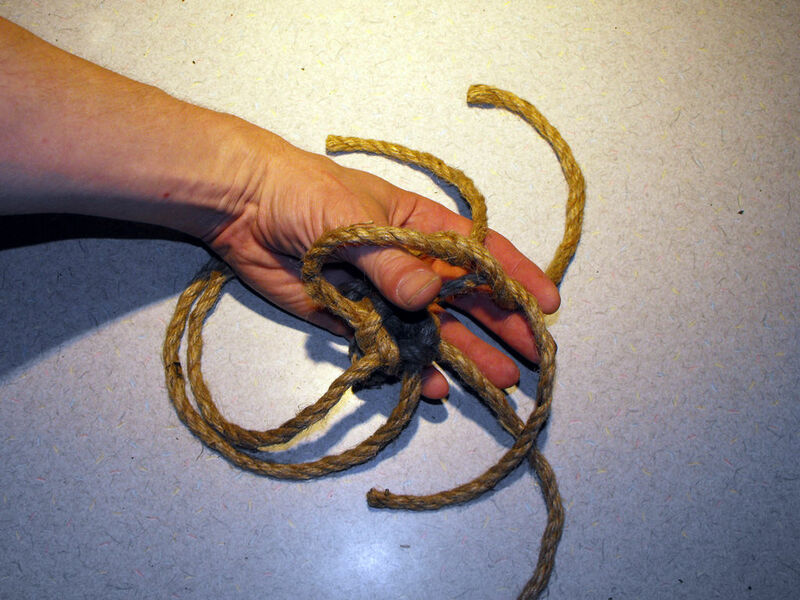 Apply white glue and using rope opposite of rope that was just tucked in tuck into same hole at base of rope (DO NOT CUT THIS IS MOUSE TAIL) and apply white glue. Now you should have reduced the 6 ropes back down to 4 ropes and have a centered fifth rope glued in place for tail. Add cat nip at this stage if desired. Finish knot at cross by taking rope #1 around thumb and over rope #2. Trim flush with knot & glue 4 remaining ropes. Untwist tip of tail and apply white glue, retwist. Allow to dry and let your cat enjoy!!! I am sure my cats would absolutely love this. I guess it would be possible to stuff some catnip in there as well? Cats love sisal. I think these would make a nice hand-made gift for the cat lover who has everything.